Last edited by bbjsw10; 08-17-2008 at 05:07 PM.. I had an injector kill switch on a metro, problem was it wouldn't shut off cleanly. I switched to the camshaft pickup trick (disables ignition) and it is a much cleaner transition to off and restarting, and maybe I can reuse that fuel on relight . You could kill both too with the right combination of relays, that would be more like what happens when the key is turned off. This camshaft pickup you are talking about what is it and where? Would my 91 have it? I have been wanting to do something like this and make my switch control both relays at same time. EDIT: I looked in service manual, has camshaft position sensor with 2 wires a ign. ref. in and ign. ref. high would these be what you are talking about? Couldn't I just use a second relay to kill power to coil? Last edited by bbjsw10; 08-04-2008 at 09:56 PM.. Thanks! I'm gonna save this post for careful study. Difference between Injector Switch and Fuel Pump Switch? What's the ideal way to cut the engine off using a switch? It seems like a lot of people are opting for the Injector switch. I read a very easy DIY post that cuts into the fuel pump wire to act as a theft deterrent. Would this also work? I use my to do EOC. That is whenever I have a chance to coast I use it to "kill" engine, then bump start in 5th gear at speeds as low as 5mph. I don't like the idea of shutting off fuel pump to kill engine. The injector is designed for that pressure. Would work awesome for theft deterrent. If an injector kill doesn't shut off the engine quickly or cleanly it's either not completely killing the injectors or your injectors are leaky. I would hesitate to use an ignition-only kill on an EFI car because that means your injectors will be spraying fuel through multiple crank revolutions with no ignition to burn it up. This can cause oil dilution, scoring of the cylinder walls, and wasted fuel. Even golf carts use a fuel shut off to kill the engine because the ignition ground causes the fuel/oil issues. Of course you could use BOTH an injector and ignition kill (like the key switch)...that would do the trick. These are the reasons why I did an injector kill instead of ignition kill. I don't like the idea of unburnt gas sitting there. 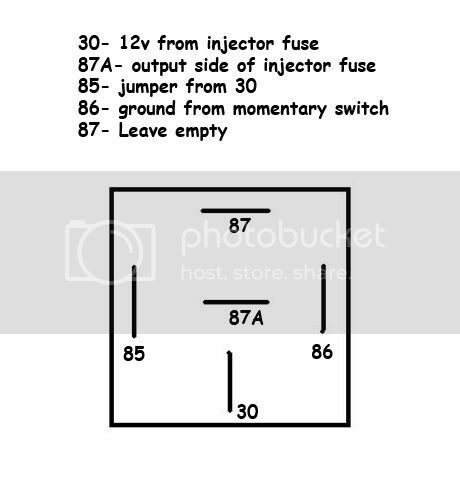 This how-to is on injector kill, that way the fuel gets burnt up then engine dies, no oil getting in oil or burning. FIRE BAD!! It isn't that the injectors are leaky, it is that there is a layer of fuel on the inside of the intake manifold, it is a normal state of affairs. That fuel is absolutely not usable if you "dry out" the manifold every time you kill the engine as the mixture is so far off there is no real useable power in it, and it causes the engine to stumble to a halt and it frequently relights when you didn't mean it to. If you turn off the ignition, the engine shuts down right away. That fuel doesn't really go anywhere anytime soon if the throttle is closed and the engine isn't turning, so it is still there waiting for use when you restart the engine. I do not know that oil dilution is much of a concern, I know planes would add fuel to the oil just prior to shutdown in winter and it would evaporate out when the engine is up to temp, and I don't know that much, if any, fuel is actually getting into the oil from sitting in the manifold between pulses.